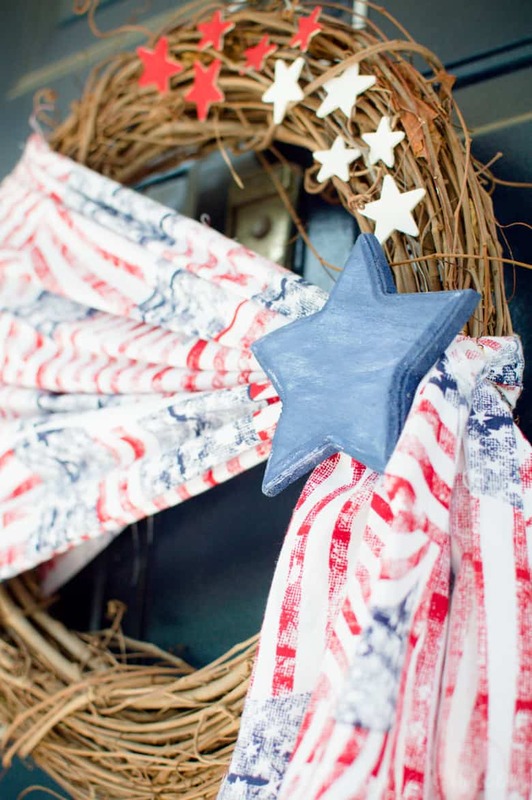 Welcome friends & family to your home all summer long with this simple Patriotic wreath! Besides doing projects with my Silhouette, my second favorite thing to make are wreaths. I was actually sad to take my last wreath off the door because I loved it so much, but I wanted to reuse my grapevine base so the old one had to go! And since it’s summer my door was just screaming for a Patriotic Wreath, which I was more than happy to make! Just like everyone else growing up we’d go see fireworks on the 4th of July. I always loved the shows and getting together with friends for the night. The best part of being a teenager was being able to go off with my friends to watch the show instead of sitting with my parents. As long as we were in eyesight of one of our parents they were okay with our wandering, ha! Even though the fireworks shows were something we did as kids, Chris and I haven’t done it in years. He has this thing about not liking them, because in California he used to set off his own fireworks in front of his parents house. Seriously, it’s a big deal in their family to get to put on the fireworks show for the neighborhood! And I guess watching someone else do the show just isn’t a fun for Chris. Unless it’s a Disney show, because those are always a thousand times better than anything else! I’m not sure if we’ll go to a fireworks show this year or if we’ll pass again. The past few years Chris has gone and bought fireworks from a local stand and set them off in our complex (our neighbors must love us), which we may end up doing again. I have to admit that I love setting off our own fireworks as often as we can. There’s nothing like the fear of burning the crap out of your hand to get you in a patriotic mood! When I was at JoAnn’s I walked by this flag inspired fabric and knew I had to have it. I wasn’t quite sure how I’d make it work with my wreath, but I decided that somehow it would! To be honest, figuring out how to use the fabric was a very, very happy accident. As I was unloading all the stuff I bought I dropped the fabric on top of my wreath base. I wasn’t paying attention at first, but when I looked down the fabric looked like it was draped across the top of the wreath and that got me thinking; what if I wrapped the fabric around the wreath and secured it with a clear hair tie? So, I pulled the fabric tightly around the wreath and secured it with the hair tie. I loved the fact that I was able to keep the fabric in tact so I can use it for other projects later on! For all of the stars I used chalk paint and hot glue to get them to stick to the wreath base. For the large blue star I first painted it blue, then used a cotton cloth to wipe white paint on it, sanded it down a bit, and then put another layer of blue paint on top. Putting it all together would probably be simple enough for anyone else, but I’m OCD and trying to get those tiny stars to look just right took forever. Chris was sitting on the couch laughing at me as I painstakingly moved each star half an inch back and forth for over an hour before I felt they looked right. And I’m still wondering whether or not I should’ve added a few more…. But truthfully, I’m really happy with how this wreath came out! It’s so different from any other wreath I’ve done and I’m really enjoying that fact. Busting outside my box definitely worked in my favor this time! What do you do for the 4th of July? Would you use fabric to make a unique patriotic wreath to hang on your door for the holiday? I think I was spoiled as a kid when it comes to 4th of July fireworks. We lived on the water so I could watch the fireworks from the comfort of home. Every now and again we would be in another city for the 4th, but somehow we always managed to find the perfect spot. I love the wreath idea. It is festive and has a rustic feel. This is such a cute idea. I’m a little crafty DIY challenged and even I can do this. Thanks. Oh my gosh, I love that fabric! I’m not the craftiest person in the world, but I think I could do this! This is such a cute idea. I’d love to give it a try. I love your patriotic wreath! 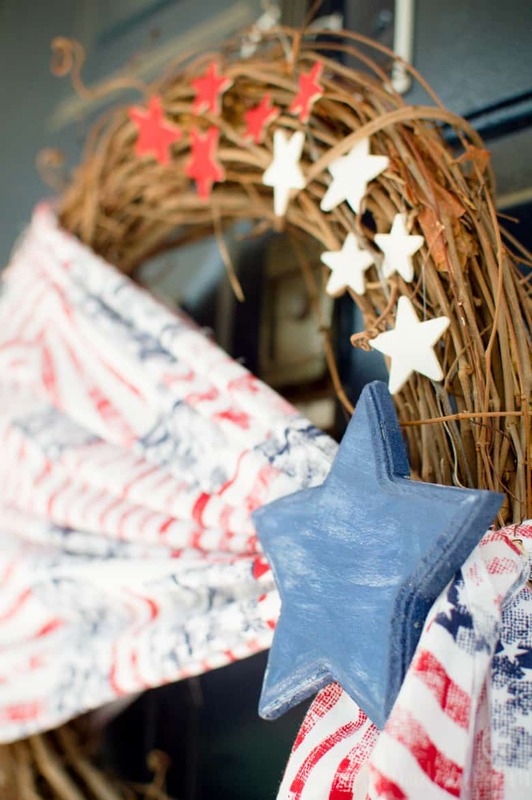 It would be perfect for 4th of July celebrations and you will have the coolest wreath in the neighborhood. This is a super cute idea. We love celebrating 4th of July where we live with parades and fireworks! That is so cute! I am so not crafty. I really admire those that can make such beautiful things! This is just too cute!! I love the 4th of July and am a sucker for cute wreaths! Pinning! that is too cute. I really like the simple and patriotic look it has. So cute and easy to make. I made one last year that was so time consuming. This looks easier. How beautiful! I’ve never made a wreath, but I have seen so many great DIYs on the blogs I read. I don’t know why, but I have always been drawn to red, white and blue decor. I absolutely love it and will gladly display it any time of year. This is a super cute wreath. I love it’s rustic look! I’d definitely hang something like this to celebrate the holidays. 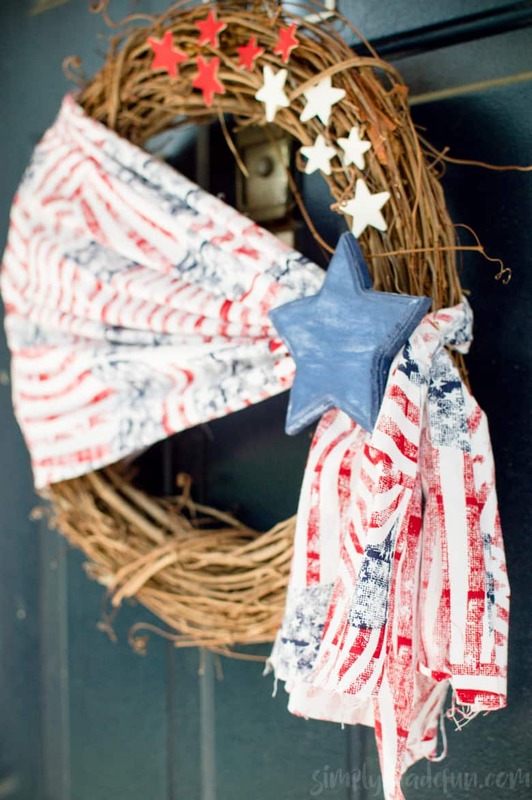 I love the simplicity of this craft….we normally don’t do anything decorative for the Fourth. I love how just a few small things brought together can make for a special craft for the holidays. I can’t wait to give this a try.